A narrow gauge tramway existed in Furness Clough for over 150 years. John Farey (1766 - 1826) was a noted geologist and a prolific writer. His book "A general view of the agriculture and minerals of Derbyshire " was published in 1811. Farey wrote about a railway branch which proceded under the turnpike road, 1 mile to Diglee Colliery. There were tipplers on the canal wharf for loading carts as well as boats with coal . There is also reference to Jow-hole old furnace being near to the start of the tramway. The Peak Forest Canal opened in 1796 and the Turnpike in 1804. It seems likely therefore, that the tramway was constructed between these dates. The tracks were an extension of the line which emerged from the mine adit in Furness Clough. Built to a gauge of 19inches, the line continued downhill towards the village passing under Buxton Road and emerging from immediately below what is now the "chippy". The line then passed under the Manchester - Buxton railway turning sharp left on reaching the canal and finishing alongside the wharf near to the dock which was at one time spanned by a stone warehouse. The brickworks was established in 1890 and probably the route of the tramway was altered to skirt the new buildings and kilns. Various sidings were added to link the brickyard to colliery and canal. On the main line railway, a siding had been built to serve the business of Levi and Elijah Hall, one time owners of the colliery. A further siding led from here to finish at Station Road, where the entrance to the Marina is now situated. This siding appears to have been re-sited closer to the station and the branch to Station Road removed. 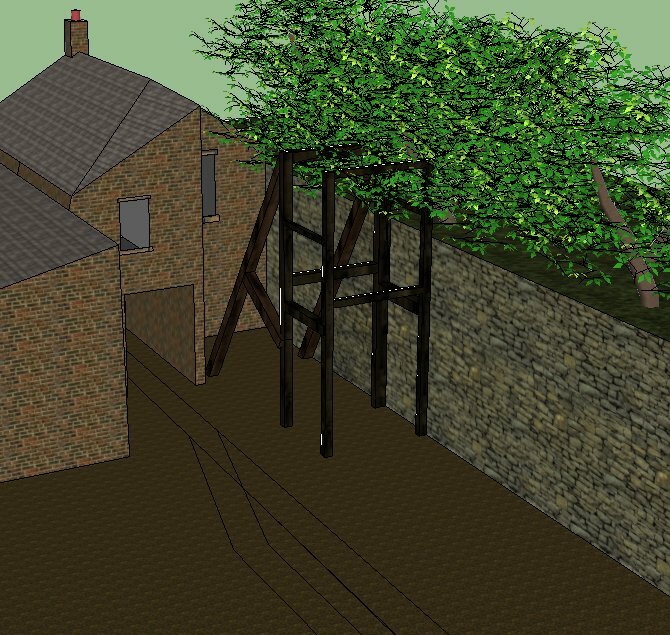 Where the tramway passed under the main line, a branch was constructed turning sharp left and rising to finish alongside what had become Knowles Siding. This allowed for the transhipment of finished bricks and firebacks to railway wagons and for the import of clay, presumably to supplement that extracted from the Furness Clough Mine. The connection to the canal wharf was removed some time before the closure of the tramway. The precise date of removal of the tramway is not yet established although it appears to have been around about 1960. The colliery was entered through an adit in Furness Clough which was enclosed by a stone building and nearby was an earlier shaft. The computer reconstruction below illustrates this. From the mine entrance a path led up to the field below Heatherby on Diglee Road and this is where the ponies were grazed and stabled. Bungalows now stand on the site of this field. If you have enjoyed visiting this site you may wish to make a contribution to Society funds.